Their 2009 movie documentary The Story Of Anvil had made the band famous over the world, following seemingly endless years of energy- sapping tours. Their albums are considered as landmarks among a musical genre. Their most recent release “Juggernaut Of Justice” from 2011, was a powerfull and unrelenting thunderbolt of the first order. Now this Candian cult metal act are back with their new recording “Hope In Hell”. The album presents guitarist/ vocalist Steve , drummer Robb and their new bassist Sal Italiano. 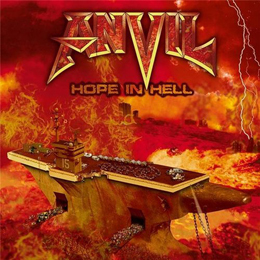 Don’t expect any surprises on this album, it’s the kind of album that Anvil fans will love: no concessions to short- lived trends, no modern frills but traditional metal with lots of classic rock music elements.